So after reading more posts and articles about guanciale, I realized I treated it wrong when I made my pasta. Instead of the crunchy brown bits it should be, it was more of a chewy, meat. Like ham, but a bit tougher and porkier. 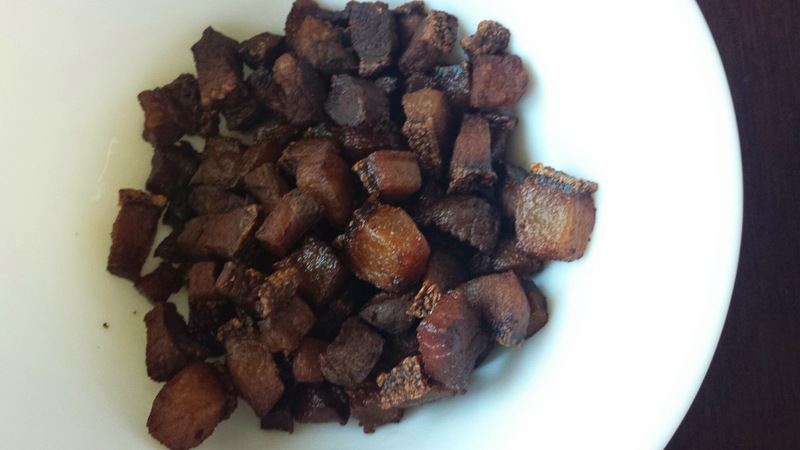 So for the next recipe, I decided to fry some guanciale. I had it chopped in small pieces, put it in a pan, and added a bit of water to render the fat. This was then fried until it was brown and delicious. So was it really better than bacon? Well, it was really more flavorful, and I am talking about it being porkier again, but in a better way this time. At least I know now how to optimize this ingredient since I still have about 600 grams left! Did you put oil or just the water? Just the water. The made it easier for the fat to come out of the pork, so it fried in its own crispy goodness. Just about 3 tablespoons of water for about 3 bacon strips worth of guanciale.